Legendary performer Nina Simone sang a mix of jazz, blue and folk music in the 19650’s and 60’s, later enjoying a career resurgence in the ‘80s. A staunch activist in the Civil Rights Movement, she was known for tunes like ‘Mississippi Goddam”, “Young, Gifted and Black” and ‘Four Women”. While she may be gone, Simone left a lasting impression on the world of music, art and activism. She sang to share her truth and her work still resonates with great emotion and power. Simone inspired an array of award-winning performers, including Aretha Franklin, Lauryn Hill, Joni Mitchell just to name a few. 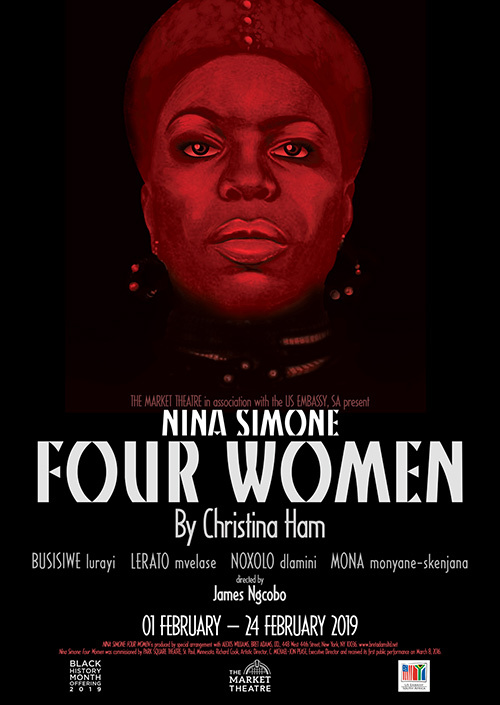 Nina Simone Four Women written by Christina Ham uses the framework of one of Nina Simone’s most blistering songs “Four Women” to give voice to a group of women who suffered from self-hatred due to the different hues of their skin. These matriarchs of Emancipation carry their songs of praise and protest deep within their spirits. These voices of angels unite in a chorus to cast out the demon of segregation. Busi Lurayi, Lerato Mvelase, Mona Monyane Skenjana and Noxolo Dlamini are an all-star cast of remarkable talents brought together by the Market Theatre’s artistic director, James Ngcobo, for the South African premiere of Nina Simone Four Women at the Market Theatre. His clever direction of the production will evoke the emotions that these four women went through in this challenging period piece. Playwright Christina Ham is a graduate of the University of Southern California and holds MFA in Playwriting from the UCLA School of Theatre, Film and Television where she was a Graduate Opportunity Fellow. She is a two-time recipient of a McKnight Fellowship in Playwriting and a Jerome Fellowship from the Playwrights Centre in Minneapolis. Her plays have been developed and produced in the US and Internationally. By presenting an all-South African premiere of Christina Ham’s play the Market Theatre continues its tradition of presenting high quality and inspiring productions to mark the Theatre’s annual Black History Month observance. This year marks the sixth Black History Month production staged at the Market Theatre with the support of the US Embassy in South Africa. Previous productions include Lorraine Hansberry’s Raisin in the Sun, Jeff Stetson’s The Meeting (2017) and One Night in Miami written (2018) by Kemp Powers. Black History Month is an annual observance in the United States, Canada and United Kingdom and growing globally as a remembrance of iconic people in the history of the African diaspora.